The gingiva is exposed to irritation from biofilm, food impaction, calculus, irregular restorations, and iatrogenic factors, which can result in localized proliferative lesions. These nonneoplastic lesions are characterized by tissue growth, with fibrous or flaccid consistency, reddish color, and the absence of or symptoms ranging from mild pain to bleeding. The lesions can be sessile or pedunculated and can be also occur in other intraoral sites. POF is a benign reactive inflammatory hyperplasia occurring exclusively in gingiva. It presents as an asymptomatic mass with normal color and a smooth or ulcerated surface. The characteristic that differ it from other gingival proliferative lesions is the presence of mineralized tissue, which is the most important histopathological feature to establish the final diagnosis. Mucosal irritants such as gingival chewing strength, plaque, dental calculus, and food impaction are associated with POF. GF is a benign enlargement of keratinized gingiva, localized or generalized, that can interfere with speech, mastication, occlusion, lip continence, and facial appearance.,,, It can occur as a nodular form, which is the most common type and it is characterized by the presence of multiple symmetric growths in the dental papillae resulting in an uniform enlargement of the gingiva that does not affect the alveolar bone. Furthermore, the lesion has a potential to accumulate biofilm, which can favor caries and periodontal problems. It can have multiple etiology such as hereditary GF, neurofibromatosis 1, rare syndromes, inflammation, and idiopathic nature and can be associated to some drugs such as phenytoin and cyclosporine or nifedipine, and calcium channel blocker., Such lesions can begin at or before puberty and can be associated with erupting teeth, both deciduous and permanent. Some authors ,, suggest the hereditary involvement as a result of an autosomal dominant gene, although they also admit some cases of recessive transmission. There are several studies in the literature regarding the frequency of proliferative lesions in gingiva based on records of oral pathology biopsy services, but few of them dedicated to the pediatric population. Studies assessing the prevalence of oral lesions show that 6.6–20.6% of biopsy specimens of oral lesions that are sent for histopathological examination are from children and adolescents.,,,,,, The purpose of this study was to describe the distribution of gingival lesions based on clinical and histopathological diagnosis in a pediatric and hebiatric population. A retrospectively study was conducted based on the data evaluated in the clinical charts of individuals aged between 0 and 18, admitted to the Oral Medicine Outpatient Clinic, Universidade Federal do Paraná (UFPR), Brazil, for 15 years. Clinical charts with biopsy records from a 15-year period (1994–2009) were retrieved from the archives of University's Oral Medicine Outpatient Clinic. The study was approved by the University Research Ethics Committee (CEP/SD 810.145.09.10). Inclusion criteria comprised all the patients aged from 0 to 18 years old with histopathological confirmed the diagnosis of gingival proliferative lesion. Exclusion criteria comprehended histopathological inconclusive diagnoses. The proliferative lesions identified were classified into four categories: PG, PGCL, GF, and POF. Additional data about the origin of referral, gender, age, race, average size, and mean evolution, were compiled. The data were registered by one researcher and analyzed through descriptive statistics and Chi-square test using software Statistical Package for Social Science, 17.0 (IBM, Chicago, IL, USA). During the period from 1994 to 2009, 5129 patients were referred to Oral Medicine Clinic, and 669 (13%) aged between 0 and 18 years old. Most patients were male (57.7%), white (77.7%), and aged between 13 and 18 years old presented the highest number of lesions. Mandible was the more affected site (51.2%). [Table 1] shows the distributions of patients according to gender, age, race, lesions site, and lesions mean size for each category of the proliferative process. Forty-five proliferative gingival lesions were diagnosed, corresponding to 6.7% lesions in these children and adolescents. The most frequent lesion was PG (42.2%), followed by PGCL (24.4%), GF (22.2%), and POF (11.1%). [Table 2] shows the prevalence of each lesion. Public health system of Curitiba was responsible for the majority (75.9%) of patients referred to the University's Outpatient Oral Medicine Clinic. UFPR Oral Medicine Outpatient Clinic is a referral center for diagnosis and treatment of oral lesions in this region of Brazil. This study analyzed 5,129 charts in a period of 15 years; to obtain an epidemiological profile of the population attended the service. Similar studies can be found in the literature; however, different data about age group, period of study, sites examined, and disease subgroups classification make it difficult to establish comparisons and may lead to misinterpretation. According to Zuñiga et al., there have been 12 studies performed in different countries, which evaluated the relative frequency of oral lesions in specimens of pediatric patients. To the best of our knowledge, this is the second report dealing exclusively with pediatric gingival reactive lesions after the one conducted by Buchner et al. In the present study, it was found that 13% of all oral lesions diagnosed into a 15-year period occurred in patients between 0 and 18 years old. Previous studies based on histopathological analysis reported a slightly higher percentage of reactive hyperplastic lesions in young patients. Buchner et al. found 16% and Picciani et al. found 19.3% in patients aged 0–19 years old, while Dhanuthai et al. reported 15% of oral lesions diagnosed in patients aged 0–16 years old. Zuñiga et al., in a similar observation period, showed a prevalence of 20.6% pediatric lesions of the total number of biopsies. Nonetheless, Jones and Franklin, studying patients from 0 to 16 years old found a prevalence of 8.2% of all cases diagnosed, similar to Lima et al. and Wang et al. (6.6%) that made their analysis in patients aged from 0 to 14 years old. Zhang et al. analyzed reactive proliferative lesions, from 3 to 84 years old, and observed that lesions were more frequent in the fourth and sixth decades of life [Table 3]. The present study found that 45 (5.8%) of the total injuries in children and adolescents were gingival lesions, different from Jones and Franklin that registered 9.9%, for gingival and periodontal pathology. Lima et al. registered 11% of reactionary gingival lesions in the total number of pediatric biopsies. Lesions were more frequent in white boys (57.8%), and mandible was the most preferred site. PG was the most prevalent lesion, similar to other studies  Buchner et al., on the other hand, found POF as the most frequent lesion followed by PG and Zhang et al. observed GF in 61% of cases. Although drug-induced gingival overgrowth has a high prevalence among male children and adolescents, probably because of the population referred to our service, we did not observed a high frequency of this condition. Studies show that hormonal influence is important in the development of different gingival proliferative process ,, and suggest special orientation about oral hygiene in people with hormonal fluctuations, such as adolescents, women after puberty, and pregnant women. Discrepancies found among different studies, might be explained by a lack of pattern on data collection and analysis as well demographic variations. Nonetheless, pediatric patients present a significant number of oral lesions that must be correctly diagnosed, and such epidemiological surveys are helpful determining differential diagnosis. POF, PGCL, PG, and GF are proliferative gingival lesions that can show very similar clinical characteristics, but can present distinct infiltrative features and recurrence risk. The data presented may aid clinicians to decide the best approach for each diagnosis. The correct evaluation of pediatric patients before the biopsy is fundamental for better management of children oral lesions. Buchner A, Shnaiderman A, Vared M. Pediatric localized reactive gingival lesions: A retrospective study from Israel. Pediatr Dent 2010;32:486-92. Pedron IG, Utumi ER, Tancredi AR, Perez FE, Marcucci G. Non-neoplastic proliferative gingival process in patients undergoing orthodontic treatment. Dental Press J Orthod 2010;15:80-7. Salum FG, Yurgel LS, Cherubini K, De Figueiredo MA, Medeiros IC, Nicola FS. 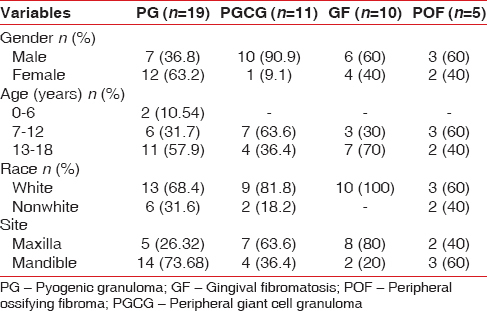 Pyogenic granuloma, peripheral giant cell granuloma and peripheral ossifying fibroma: Retrospective analysis of 138 cases. Minerva Stomatol 2008;57:227-32. Vieira JB, Gaetti-Jardim EC, Lima de Castro A, Miyahara GI, Fellipini RC. Fibroma ossificante periférico de mandíbula – relato de caso clínico. RFO 2009;14:246-9. Gordón-Núñez MA, de Vasconcelos Carvalho M, Benevenuto TG, Lopes MF, Silva LM, Galvão HC. Oral pyogenic granuloma: A retrospective analysis of 293 cases in a Brazilian population. J Oral Maxillofac Surg 2010;68:2185-8. Al-Khateeb T, Ababneh K. Oral pyogenic granuloma in Jordanians: A retrospective analysis of 108 cases. J Oral Maxillofac Surg 2003;61:1285-8. Jafarzadeh H, Sanatkhani M, Mohtasham N. Oral pyogenic granuloma: A review. J Oral Sci 2006;48:167-75. Saravana GH. Oral pyogenic granuloma: A review of 137 cases. Br J Oral Maxillofac Surg 2009;47:318-9. Falaschini S, Ciavarella D, Mazzanti R, Di Cosola M, Turco M, Escudero N, et al. Peripheral giant cell granuloma: Immunohistochemical analysis of different markers. Study of three cases. Av Odontoestomatol 2007;23:181-8. Vazquez Pineiro MT, Gonzalez Bereijo JM, Niembro de Rasche E. Granuloma periférico de células gigantes: Caso clínico y revisión de la literatura. RCOE 2002;7:201-6. Menezes FS, Barros JS, Silva D, Suzuki CL, Freitas TM, Falcão MM. Peripheral ossifying fibroma: A clinical and epidemiological survey. RBO 2010;67:106-10. Shi J, Lin W, Li X, Zhang F, Hong X. Hereditary gingival fibromatosis: A three-generation case and pathogenic mechanism research on progress of the disease. J Periodontol 2011;82:1089-95. Bittencourt LP, Campos V, Moliterno LF, Ribeiro DP, Sampaio RK. Hereditary gingival fibromatosis: Review of the literature and a case report. Quintessence Int 2000;31:415-8. Coletta RD, Graner E. Hereditary gingival fibromatosis: A systematic review. J Periodontol 2006;77:753-64. Ramakrishnan T, Kaur M. Multispeciality approach in the management of patient with hereditary gingival fibromatosis: 1-year followup: A case report. Int J Dent 2010;2010:575979. Doufexi A, Mina M, Ioannidou E. Gingival overgrowth in children: Epidemiology, pathogenesis, and complications. A literature review. J Periodontol 2005;76:3-10. Picciani BL, Santos BM, Moleri AB, Teixeira HG, Silva DG, Tinoco EM, et al. Non neoplastic proliferative lesions on the periodontum: An epidemiological study. R Periodontia 2008;18:52-6. Zuñiga MD, Méndez CR, Kauterich RR, Paniagua DC. Paediatric oral pathology in a Chilean population: A 15-year review. Int J Paediatr Dent 2013;23:346-51. Lima Gda S, Fontes ST, de Araújo LM, Etges A, Tarquinio SB, Gomes AP. A survey of oral and maxillofacial biopsies in children: A single-center retrospective study of 20 years in Pelotas-Brazil. J Appl Oral Sci 2008;16:397-402. Zhang W, Chen Y, An Z, Geng N, Bao D. Reactive gingival lesions: A retrospective study of 2,439 cases. Quintessence Int 2007;38:103-10. Tomazoni AP, Raymundi B, Busin CS, De Carli JP, Silva SO. Comparative study of the proliferative activity of the peripheral giant cells lesion and of peripheral ossifying fibroma. Rev Odontol 2009;17:6-12.